Less than three weeks before the midterm elections, Washington's Ebola blame game has spread to the arcane world of the federal budget. Republicans claim credit for boosting the budget of the Centers for Disease Control and Prevention last year while charging President Barack Obama with trying to cut it now. Democrats counter that the GOP-controlled House is behind cuts to the National Institutes of Health, which researches drugs to fight Ebola and vaccines to prevent it. The budgets for the CDC and health research have indeed been flat or have shrunk slightly in recent years as House Republicans forced cuts to domestic Cabinet budgets upon Obama. This was especially pronounced in a 2011 budget pact that created automatic spending cuts known as sequestration, as well as stringent limits on the overall pot of money that can be appropriated for programs like disease control and research into a cure for Ebola. The CDC's budget was a robust $6.8 billion in 2010, the last year Democrats controlled Congress. Last year's budget for the CDC: $6.9 billion. And Obama's request for the current year? It's $6.6 billion, a cut of almost $300 million. That's right: Obama asked for less money than the CDC got last year. The budget for the National Institute of Allergy and Infectious Diseases, where research on fighting Ebola is centered, has also been stagnant in recent years. It dropped from $4.5 billion in 2010 to $4.4 billion last year. The broader NIH budget has fallen from $31 billion in 2010 to $29.9 billion last year. If these cuts are bad, assigning blame is far more complicated than both sides make it seem, when they blame each other. Obama's signature is on each spending bill that has set the budgets for both agencies; in other words, he went along. And Democrats mostly voted for them. Moreover, sequestration - with its blunt budget ax - was an idea that originated in the Obama White House. In divided government, all sides - the Obama administration, Democratic-held Senate, and GOP-controlled House - share responsibility for the recent budgets of the key agencies responsible for battling Ebola. All three sides have collaborated to produce those final budgets since 2011. In reality, any cuts to the NIH and CDC are deeper than they appear because inflation eats into the purchasing power of both agencies. 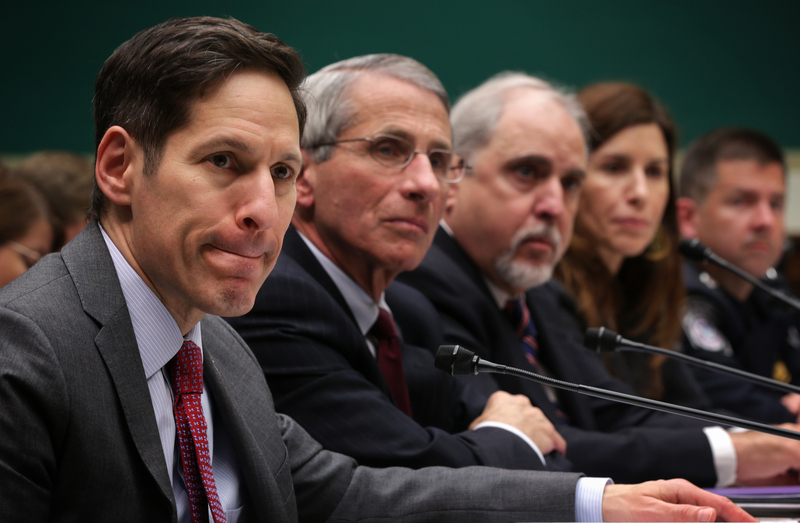 So, a program at the Department of Health and Human Services that helps hospitals prepare for Ebola and similar diseases like the Enterovirus has absorbed a 44 percent cut in its budget since 2010 once inflation is taken into account. Both parties in Congress and the White House obviously know inflation eats away at a budget increase or makes an actual budget cut deeper, even if they can't foresee what inflation will turn out to be. That doesn't change the fact that budgets are a creation of all of the players hurling blame at each other now.